I have been a big fan of water ionizers since I first began drinking the water two and a half years ago. My water ionizer changed my life for the better… a lot better. I have been blogging a lot about the antioxidant filters lately, so you might think I have changed my thinking about water ionizers. That would be a false assumption because you don’t turn your back on an old friend. However,the introduction of antioxidant filters is changing the landscape of the alkaline water industry because the low cost effective machines have made healthy drinking water affordable for everyone. Water ionizers work by the process of electrolysis. That means that when water is run over the electrically charged plates, the water is separated into two steams. One of the streams is rich in hydrogen ions (H+) and is called acidic water, and the other is rich in hydroxyl ions (OH-) and is called alkaline water. People drink the alkaline, or negatively charged water for its health benefits. People use the weaker forms of acidic water as a “beauty water” for their skin, or the stronger acidic water for cleaning. When an electrical current (Amps) is run through the plates in the ionization chamber, the ionization process is enhanced. As the power is increased, the ionization increases. A water ionizer won’t ionize unless there are cations such as calcium or magnesium in the water, or anions such as salts or bicarbonates. Most of the water ionizer companies place calcium or magnesium in their filters to insure that the ionization process is very strong. In fact, the minerals that are introduced by the filters in water ionizers will ionize the water on its own without adding the electrical current that is supplied during electrolysis. The water ionizer companies that are selling the “bigger is better” scam would never want you to believe it, but it is true. How do I know this to be true? If you talk to anyone who has worked in the industry on the technical support or customer service side of the industry, they will tell you that a common complaint is that when customers receive a new water ionizer, they find that when they put the pH reagent drops in the water from different levels of ionization, the water turns purple for all settings. When the water turns purple with the pH test drops, that means that the pH of the water is 9.5 or higher. In fact, the water often turns purple when the pH reagent is used on the “purified” water that has not even been ionized when a machine is new. How could that be when there no electrolysis has taken place? The answer is simple: when the minerals introduced by the filters interact with the water supply, ionization occurs which causes the test drops to turn purple. Purple water test results across the board are a nightmare for the tech support people. The tech support people at the various water ionizer companies tell their customers that when they run about 200 litres of water through their machine, the customer will start to see that different pH levels can be achieved and they are right. After the small amount of calcium or magnesium that is packed into the filters has been worked off, the filters will provide more normalized results. What they don’t tell you is that in soft water conditions, the performance of the water ionizer machines begin to lose their performance after 6 to 8 weeks unless customers install an inline re-mineralization filter before the water ionizer. Most people stop checking their test results after the first week or two so they never realize that their machines are not producing the desired results. It is important to test you machine with the pH reagent drops every week or two. Antioxidant filters perform two functions. They remove contaminants from the water, which is the water filter part. They also create powerful antioxidants by creating alkaline ionized water. The purifying process is fairly simple and can be achieved in one of two ways. The Alkastream people use an ion exchange system which acts like a very efficient miniature water softener plus it uses some of the standard contaminant removal media. The ion exchange system is similar to what you will find in a Brita filter. The combination of the ion exchange system and a the standard removal media provide for very effective removal of chlorine, fluoride, VOCs, lead and mercury, which are the main contaminants in our water as well as other stuff that you don’t hear too much about. The Revolutionizer doesn’t use the ion exchange system, but it does use the standard media known in the industry to remove contaminants. I don’t know what the Ion Ways products will be using for purification as they haven’t announced anything yet. The fact Ion Ways hasn’t provided any information about their machine other than telling us the price indicates to me that they are a few months away or more. Now lets turn to the antioxidant function of the antioxidant filters. The process is really simple and I started to discuss it when I described the fact that most of the water ionizer companies put a small amount of calcium or magnesium in their filters to assist in the ionization process. Dr. Hayashi, M.D., the “Godfather” of water ionizer research spent 15 years from 1985 to 2000 researching how and why water ionizers worked. By the year 2000, Dr. Hayashi came to the conclusion that you didn’t need to use electricity to ionize water through the process of electrolysis at all. In fact, Dr. Hayashi has requested that the great research paper that he published in 2000 that appears on many water ionizer websites be removed. Dr. Hayashi stands by his 15 years of research, but he found a low cost method of producing the same powerful antioxidant results. Dr. Hayashi determined that it was free hydrogen that produced the beneficial health results, and you didn’t need electrolysis to achieve free hydrogen. He has officially requested that the high priced water ionizer companies stop using his research to promote their products when there is a much lower cost and effective alternative. I know, this stuff seems complicated and I bet nobody cares, but I had to learn about it so you have to read it… so there! 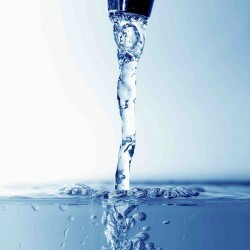 The bottom line is that if you want healthy drinking water, you don’t have to purchase an expensive water ionizer. Which machine should you purchase? If you want purified water that provides the benefits of antioxidant alkaline water, all you need is an affordable Antioxidant Filter. If can afford a water ionizer and a pre-filter system, you can have the added benefits of receiving strong and weak acidic water, and very high alkaline water that will remove pesticides from the surface of fruits and vegetables. The additional three benefits are great to have. My wife loves the 5.5 pH “beauty water” as she uses it to wash her face and even to rinse her hair after she has used shampoo in her hair. You can buy 5.5 pH water very inexpensively from a grocery store in the form of Aquafina bottled water which is made by Pepsi, but it is not as convenient. Some people use the strong acidic water as a disinfectant. We have tried it and it works, but we never seem to get around to it. The strong acidic water is definitely a “green” solution that we should all aspire to. Soaking fruits and vegetables in 11.0 pH alkaline water does help remove pesticides from fruits and vegetables. However, it does take a long time to fill a sink with the water and the operating manuals do suggest soaking the fruits and vegetables for 20 to 30 minutes. At our house, we don’t seem to use this great feature very often because we never seem to have the time, which is more of a comment about our busy lives than a criticism of water ionizers. Typically, my wife just buys organic fruits and veggies now that they are more competitively priced. As always, personal choices are what makes us all unique. You should choose which type of machine suits your needs and then select the brand and the retailer that feels right for you. Whatever choice you make with be a good decision because it will lead to a healthier life. The comments and opinions expressed in this article are those of the author and are not intended as medical advice. Always consult your health care provider for health issues. I found your articles very interesting, except although Dr. Hayashi can make alkaline water with his hydrogen stick, it is the power of the ORP or Oxidation Reduction Potential that is the magic bullet. On Michael Kinnett’s website http://www.futurefoundationwater.com he explains the process of how ionize-alkaline water helps our immune system. As I understand it, and I could be wrong, but using the right chemicals can alkaline our fresh water system. The manciple public work source uses lye to alkaline the fresh water system because it is mandated by the federal government to do this. So because the water is alkaline doesn’t make it the main source of health, but the antioxidants from the ORP and also as I understand this ONLY through electrolysis can this be done. I would like to know where did you get your information, so I can update my data. There is no magic bullet for everyone, but water ionizers and the antixidant water filters do an amazing job. Dr. Hayashi’s hydrogen sticks do product a negative ORP, but only to a limited degree. The antioxidant water filter that I have been testing is much more sophisticated, powerful, and user friendly than a hydrogen stick, but the concept is the same. Based upon my tests on the Alkastream unit (the only AFW that I have at my disposal to test) and several of the leading water ionizers all provide virtually identical pH and ORP values when I tested the water ionizers when they were set to deliver drinking water. In other words, the output of both types of machines is the same. I have been emailing back and forth with one of our readers (Gabe) who is putting together a slide presentation showing how the AWF actually works. I always had the same idea about ORP that you do. When I visited a number of factories in Korea in April of this year, I was able to speak with the engineers as opposed to the sales people. The engineers always spoke about the importance of free hydrogen and they completely downplayed the value of the ORP measurement. When I started researching the AWF machines, I came to realise that Dr. Hayashi has been saying the same thing for the past ten years. It took me a while to figure out what Dr. Hayashi was saying, but I finally “got it” when I spent some time working on a Periodic Table in conjunction with Dr. Hayashi’s equation for the formation of free oxygen. Basically, when you run water through a magnesium media, the weak hydrogen bond in water is broken as the electron hungry oxygen atom is attracted to the more surplus electrons supplied by the Magnesium atom. The net result of the reaction is that magnesiim hydroxide Mg(OH)2 is formed which is a powerful electrolyte. The net result is that the liberated hydrogen atoms form free hydrogen, which is what neutralizes the harmful free oxygen that we have in our bodies. Dr. Hayashi maintains that the ultimate “reducer” is free hydrogen as the H atom of H2 molecule will donate its electrons to the free oxygen, there by forming water which is harmless. I once believed that it was ONLY the process of electrolysis that antioxidants as you have noted. I now understand that is not the case. When water reacts with Cations (electron donating atoms) such as Calcium of Magnesium, ionization occurs naturally. I can give you a perfect example of this. When I used to sell water ionizers, one of the biggest problems that we had was dealing with customers who phoned in when they first hooked up their machines. When they tested the water with the pH reagent drops, they found that the test results produced purple water for all levels of ionization and even for the unionized “pure” water. The customers naturally thought that their machines were too strong or didn’t work. I had to explain to customers that the companies that built the machines packed calcium or magnesium into the filters when they were new and that as soon as the first couple of hundred litres of water had passed through, the problem would disappear, which was true. What we didn’t discover until we had been at it for awhile was that in soft water conditions, after about six weeks, the machines produced only green water test results when the pH reagent drops were added. The reason for this was that there were not enough minerals in the water to provide adequate ionization. For the companies selling the machines, this was not as big a problem as you might think because almost every customer stops testing their machine after the first week or two. However the results were not as good as advertised. I had to learn all this by myself because the company I worked for provided nothing and in fact didn’t even know about the problem. My solution was to send customers remineralization filters that put “Calcium and or Magnesium” into the water supply. The remineralization filters had to be changed every six months, but at least they allowed for proper ionization. So, what was really going on? The calcium or magnesium in the new filters produced its own ionization and corresponding strong pH and ORP values, even when the ionization chamber was not being activated (which is what happens when you press the “Pure of Clean” button). As the calcium and magnesium wore off, the machines stopped producing effective pH and ORP values unless the source water had enough minerals to create the ionization. So what did the water ionizer companies do? The promoted “bigger is better”. More plates and more power. They found they could compensate for a shortfall of minerals in the water by applying more and more power. Instead of fixing the filter content problems, they just added more power because it was something they could charge more money for. When I was in Korea, the engineers thought that “you Americans” were stupid. I heard it more than once. The explained that the extra power was not needed and was actually harmful because it eroded the platinum coating on the titanium plates faster, which represented a health risk. Dr. Hayashi came to the same conclusion ten year ago. He has been telling us since 2001 that we didn’t need electrolysis at all to produce the healthy benefits from the water. He has been telling us all these years that all that was needed was to run water through a magnesium medium and to use magnetics to provide longer term stability to the free hydrogen. His chosen method was the hydrogen stick. The new AWFs do the same thing as the sticks, but much more effectively and efficiently, and they also purify the water first. I hope you have made it through this long long long explanaion. I might just turn it into an article. Here’s the animation you mention above. http://nextgenionizer.weebly.com/video.html. I think it captures what you and I have been discussing. Never thought I’d be back into the periodic table this much. The knowledge does help though. I met with a holistic dietitian this afternoon and being able to sketch it out on a napkin helped her understand much deeper. Love your feedback…and that of your readers as well. Thanks for the great animation. It illustrates in pictures what Dr. Hayashi describes in his work. You have obviously grasped what I was talking to you about when we discussed the periodic table and the work of Dr. Hayashi and I’m grateful for your effort. You are definitely on the cutting edge. There are some people using hydrogen peroxide mixed with water to treat all kinds of health problems and they say that drinking it gives lots of energy. Do you Know anything about this procedure and how it works? i´m far from the knowlodge in the subjects but what do you thinks about that.How can it be healthi if it´s a oxidant? I have to admit that I don’t know much about hydrogen peroxide. My wife uses it from time to time. I tried it once and had a bad reaction to it, so I have never don’t any research on it. Have you heard of AquaLiv? I found it while doing the water research that let me to your site. I was and I suppose still considering a water ionizer. I found your website to be the most common sensed and most importantly unbiased site yet in all my research. Back to AquaLiv, I’m having a hard time, since I am strictly a layman, not even educated at all in chemistry, decifering the basis and validity of this AquaLiv information I have found, and whether it is at all an antioxidant filter. If not how does it work and better yet is there a basis for it’s claims. Any info you could add would be much appreciated. AquaLiv is the American representative for the Hydrogen sticks sold by Dr. Hayashi. Craig Hoffman, the owner of AquaLiv is Dr. Hayashi’s defacto desciple in America. I have called Craig a couple of times but have never had the opportunity to speak with him. I have spoken to his wife/partner a couple of times and she is very knowledgable about Hydrogen ion theory. Craig has written some very interesting material about the properties or capabilities of water. I think some of it is pretty far fetched, but I’m willing to keep an open mind on the subject. The fact that he is reaching out and trying to understand the mysteries of water makes him one of my favorites. Craign also has some interesting thoughts on hyrodogen, or more specifically hydrogen ions. I assume Craig has learned from his ongoing association with Dr. Hayash,i and uses Dr. Hayashi’s experience and knowledge as the basis for his writing. Dr. Hayashi believes that hydrogen ions are the perfect solution for eliminating free oxygen (free radicals) from the body, and as such, are the ideal antioxidant. His explanation makes more sense to me than anything else I have ever studied on the subject. Dr. Hayashi’s experience in working with ionized water is unmatched and I think he is the leading authority on the subject of ionized water in the world. I like his theory of the “disassociation dance”, as it makes perfect sense to me. Craig believes that hydrogen ions created from the interaction of water with minerals such as magnesium, are much more stable than hydrogen ions created from electrolysis. His thinking is that the ions created from electrolysis are temporary and unstable. I have to agree with the theory and there is a simple test that backs up his thinking. thank you for this very helpful info, I was about to purchase kangen filter and it is indeed pricy. I wanted to make sure i’m making the right choice here. I know it’s like 4 years since you written this and I really hope I can get a hold of you because I would like to know what kind of water system you use in your home? I want to have water that I can use for health, cleaning and beautify and that’s what kangen provides but since you say there are cheaper alternatives, would you mind telling me how you filter your water at home? Since you want acidic water (cleaning and beautify), you will want to get an electric water ionizer. I think the best value when it comes to electric water ionizers is the EOS Genesis Platinum. Imo, they continue to be as good as or better than any machine on the market. I won’t get into technical details, but they have a really intelligent “back office” that allows for technical adjustments. The units retail for $1,695 but you can buy them from http://www.waterhealthcare.ca for $950 in Canadian funds which will save you another 10% if you are an American. I use a Vitev Maxx at home. It is a unit that combines a Reverse Osmosis system with a natural Remineralizing filter. I believe the Vitev Maxx offers the best of both “clean” and “healthy” water and it sells for $795. The unit may not satisfy your needs as it doesn’t provide acidic water that you would use for cleaning. My wife uses an acidic water maker than cost her about $200.